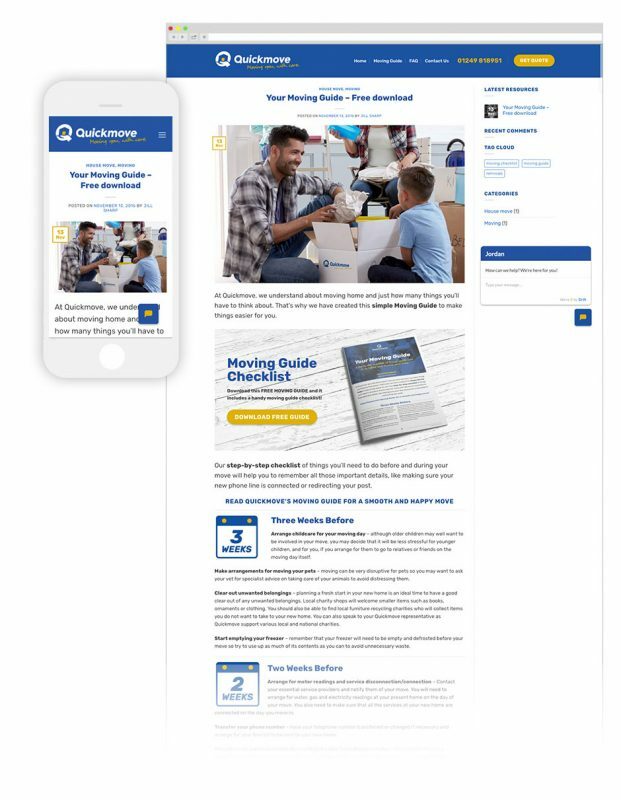 Quickmove are an established company providing national and international removal and storage services who needed a new brand and website. I love helping local businesses so when Jill from Quickmove contacted me I was thrilled to meet up. Her company was going through a transition, with big plans for the future. Jill understood her customers and really cared – and their service always received rave reviews, but their existing brand and website did not reflect this and they were not attracting the smaller, local customers. 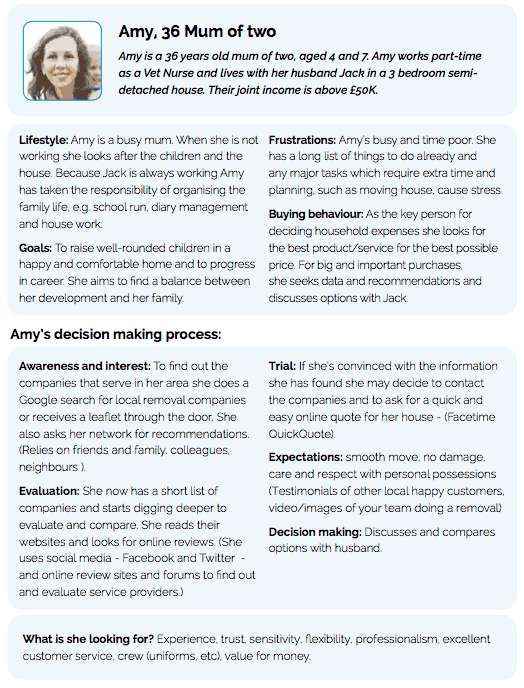 Quickmove’s target audiences were young families and couples with two and three bedroom house removals. So the brand, website and marketing needed to speak to these types of people. WHAT IS YOUR BRAND CHALLENGE? To supply a cost-effective, superior, stress-free removal service to help the regular guy. FUNCTIONAL BENEFIT? We offer a local, personal removal service that goes over and above expectations. “Just Ask” is our motto. EMOTIONAL BENEFIT? Clients are nurtured and guided. Feel ‘at ease’ and everything is under control. (Moving guide). REASON TO BELIEVE? 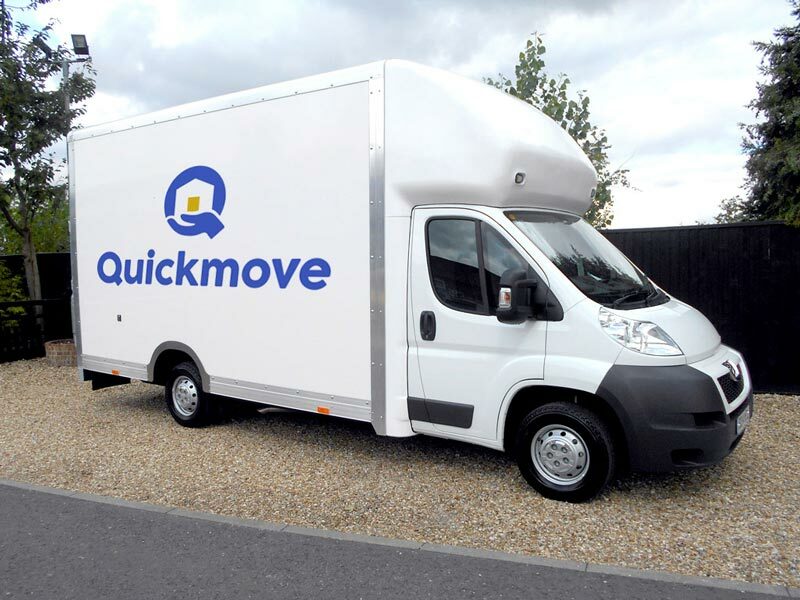 Quickmove is the local, family-run established removal company since 1971. Trusting and honest. Backed by Britannia International Consortium. Warm, friendly, established, experienced, understanding, knowledgeable. Need to get an established, local, professional company to move all their treasured posessions for them – for the best price. “First timer” Not realising how many possessions (Used a ‘Man and van’ before but now need a removal company). CUSTOMERS DESIRES/NEEDS FULFILLED? Excited and happy they’ve moved into their new home. Quickmove did it all with no hassle. I started on sketching logo ideas and knew that I wanted to do something with the ‘Q’. It has a beautiful shape with a bottom right tail and so went through a few ideas around this. 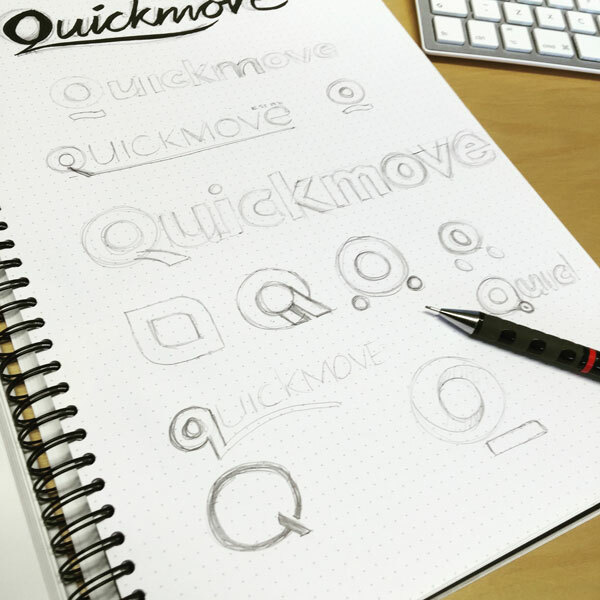 From wheels, to swooshes and strokes I then moved onto using the home and a hand combination within an icon to reflect the caring service Quickmove provide. This progressed to the ‘Q’ shape made out of the hand holding the home. I inked this up and scanned it into Adobe Illustrator to draw it up digitally. 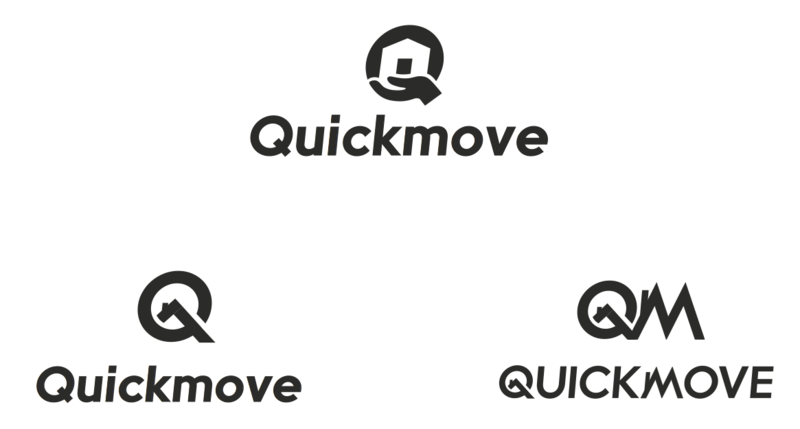 The final Quickmove Removals logo included a strapline, “Moving you, with care.” Then a full set of brand identity guidleines were created showing the elements and examples of how the Quickmove brand will be used. As part of my Brand and Website design package, a new responsive website was designed in WordPress that included a ‘Quick-Quote’ call to action. This was the primary goal of the website. To attract new customers into contacting Quickmove and offer a free ‘FaceTime’ video quote of their home removal. 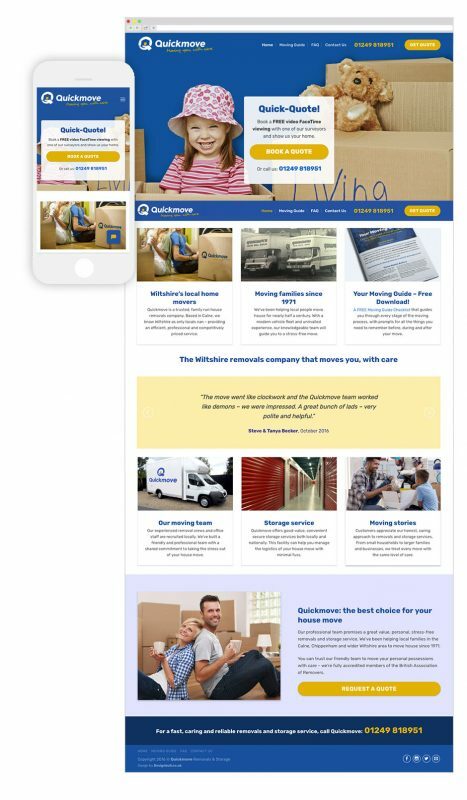 This was the primary goal of the website – to attract new customers into contacting Quickmove with the offer a free ‘FaceTime’ video quote of their home removal needs. This proved quite successful and within a week of launching their site, they had attracted a few enquiries from this. With their new website, a new, front-end content management section is included. This gave their team – after training them – complete control over editing their content. So from within the one browser window, they could add, move and copy any part of the site. I’m thrilled to add this project to the Designbull portfolio!